A growing interest in triathlon and run/walk events in Aroostook has brought together four County organizations, each working to improve the health and wellbeing of area residents, to present a series of activities in northern Maine this summer for all ages and ability levels. After seeing the number of registrants more than double for triathlons hosted for both adults and youth from the first year they were offered in The County (2012) to last summer, a second offering is being added for youth. Additionally, a swell in participation in 5K races and fun run/walks throughout the region has spurred a new such event, the return of one of the most popular and unique, and the introduction of a half marathon for running enthusiasts in the coming season. The County Fit and Fun Summer Series was announced at a press conference today in the pool area of Gentile Hall at the University of Maine at Presque Isle. Representatives from partner organizations UMPI, TAMC, CompetitorME, and the Aroostook County Action Program’s Healthy Aroostook Partnership were all present for the announcement, along with participants who will take part in the activity. The summer series will both begin and end with the triathlon events at UMPI. The return of the popular Tri-Aroostook for adults on the morning of Saturday, June 28, will be added to this year with the first-ever Tri-Aroostook Kids contest following the adult competition in the afternoon. Both of these events, the only sanctioned by USA Triathlon in northern Maine, are being coordinated by CompetitorME, a new County-based organization, along with lead partners TAMC and UMPI. Youth will have another opportunity to experience a kid-friendly triathlon at the summer series closing event on Sunday, September 7. Like the Tri-Aroostook events, the third annual REDY…Set…Let’s Go! Youth Triathlon, hosted by ACAP’s Healthy Aroostook Partnership, TAMC and UMPI, is based on the University campus, specifically Gentile Hall. The events are also a great fit for TAMC, which will provide volunteers and logistical and promotional support for all six of the activities promoted as part of The County Fit and Fun Summer Series. As the largest and most comprehensive provider of healthcare services in northern Maine, TAMC takes seriously its leading role in promoting health and wellness initiatives region-wide. The County Fit and Fun Summer Series will feature two first-time events, coordinated by CompetitorME. The Midsummer’s Night Glow Run, on Saturday, July 12, will include both a 5K and 10K road race departing from the Gehrig Johnson Athletic Complex at the Presque Isle Middle School just prior to sunset and winding through the streets of Presque Isle. The second event will bring a half-marathon to the region on Sunday, August 31. The Harvest Half Marathon (13.1 mile distance) is for all ages and will start and finish on the UMPI campus, extending through the City of Presque Isle and area countryside. To bring home that message, the winner of the two previous Tri-Aroostook (adult) competitions and a young athlete expected to take part in the inaugural Tri-Aroostook Kids, who has previously and will again compete in the REDY…Set…Let’s Go! Youth Triathlon, spoke about the expanded opportunities coming to The County this summer. “The amount of effort behind individuals around the County to organize activities and events has been inspiring. Their greatest goal is for people to have fun, bring a sense of gathering and close bonds to motivate everyone toward health and fitness through people’s experiences. This can make all the difference when personal goals need to be accomplished,” said Shawn Berry, two-time Tri-Aroostook overall winner. “I am always looking forward to the next triathlon, because it’s a fun way to keep in shape. It’s also a way to spend time with my family and friends,” said 14-year-old Jillian Jandreau of Caribou, who has participated in past youth running and triathlon events, and will take part in as many of the County Fit and Fun Summer Series events as possible. Berry and Jandreau were joined by 12-year-old Grace Bemis of Presque Isle, the top female finisher in the 11-12 age group in the REDY…Set…Let’s Go! Youth Triathlon last year. Bemis encouraged other youth to join in the event this coming summer. “I enjoyed the youth tri because the volunteers and people that run it are so nice. I like to compete and wanted to try triathlon after watching my parents in their races. Other kids should participate because it’s a fun way to get fit and meet new people,” said Bemis. Jamie Chandler, community transformation grant coordinator for ACAP’s Healthy Aroostook Partnership, who is the REDY race co-director with Adam Murchison, shared with those in attendance at the announcement her goals for the September 7 event. The sixth event to be included in The County Fit and Fun Summer Series will be the second annual Color Presque Isle 5K co-hosted by UMPI and the Wintergreen Arts Center. Color Presque Isle, for which a set date will be announced by organizers in the coming weeks, combines fun, fitness and the arts, and begins and ends at Riverside Park. Proceeds from the benefit support arts programming at UMPI and the Wintergreen Arts Center. Last year’s event was among the largest fun run/walks in the region, drawing over 400 participants. Organizers hope that by promoting the County Fit and Fun Summer Series collectively, event planners are further helping to establish northern Maine as a destination for running and fitness enthusiasts from across the United States and Canada. A USAT Sanctioned Sprint Distance Triathlon for ages 16 and older. Compete as an individual for the full sprint triathlon (swim, bike, and run) or as a team member on a relay of two or three. 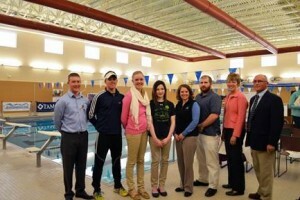 TRI AROOSTOOK will be capped at 125 athletes. TRI AROOSTOOK Kids is a USAT Sanctioned Youth Triathlon for ages 6 to 15. Athletes will compete as individuals at varying triathlon distances based on age. TRI AROOSTOOK will be capped at 125 athletes. Saturday, June 7 at 1:00 p.m. at Gentile Hall – Swim portion of TRI AROOSTOOK Kids. Parents are encouraged to participate with their children. Saturday, June 21 at 1:00 p.m. at Gentile Hall – Bike and Run portions of TRI AROOSTOOK. Parents are encouraged to participate with their children. The Midsummer’s Night 5K and 10K Glow Run/Walk is the perfect mix between serious road racing and crazy amounts of fun! Athletes of all abilities will light up the streets of Presque Isle and celebrate a healthy lifestyle! THE BONUS- a post-race movie under the stars! Registration fee: $20 / Registration: same-day, on-site 7:00 – 8:15 p.m.
Color Presque Isle 5K is a benefit event that combines fun, fitness, and the arts!. Color Presque Isle, for which a set date will be announced by organizers in the coming weeks, combines fun, fitness and the arts, and begins and ends at Riverside Park. Proceeds from the benefit support arts programming at UMPI and the Wintergreen Arts Center. Just come in white and we’ll add the color, County style! The Harvest Half is a half marathon (13.1 miles) for all ages. Compete as an individual for the half marathon, or form a relay team of up to four athletes. The Harvest Half will start and finish at the University of Maine at Presque Isle campus, run through the heart of Presque Isle, and quickly climb to the outstretched farm fields along Centerline Road, briefly run along the historic main artery to Northern Maine, US Rt. 1, then behold the rolling road that takes athletes just north of Aroostook State Park. A quick out and back portion of the course will round the run out before heading back on a nearly flat road for the remainder of the run before a roaring finish! The REDY…Set…Let’s Go! Youth Triathlon is perfect for beginners and more experienced competitors between the ages of 7 and 14. Triathlon is a multi-sport activity with three components: swimming, cycling, and running. The REDY…Set…Let’s Go Youth Triathlon is a great way for children to get active and experience the thrill of participating in a real triathlon. Five training sessions will be held prior to The REDY…Set…Let’s Go! Youth Triathlon in preparation for the event. Sunday, April 27 at 1:00 p.m. at Gentile Hall – Swim portion of REDY…Set…Let’s Go! Youth Triathlon with Erica Hemphill. Parents are encouraged to participate with their children. Sunday, May 18 at 1:00 p.m. at Gentile Hall – Run portion of REDY…Set…Let’s Go! Youth Triathlon with Amanda Cushman. Parents are encouraged to participate with their children. Sunday, June 22 at 1:00 p.m. at Gentile Hall – Bike portion of REDY…Set…Let’s Go! Youth Triathlon with Shawn Berry. Parents are encouraged to participate with their children. Sunday, August 17 at 1:00 p.m. at Gentile Hall – Swim portion of REDY…Set…Let’s Go! Youth Triathlon with Erica Hemphill. Parents are encouraged to participate with their children.